Pink Fuel has these two amazing skins out at the Gleaming Waters sim! The Bloodthirsty skin is $100L and includes 3 brow colors and 2 cleavage enhancers on tattoo layer. The Dia De Los Muertos Skin is a free hunt gift (look for the leaf… it’s near skulls) and is one of the most artistic skins I’ve seen in SL. 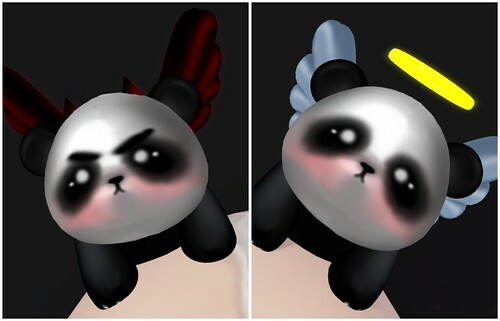 I went to Pink Fuel’s main store by mistake cos I didn’t remember where the Bloodthirsty skin was sold at, and won these two pandas from the Lucky Chair! I love it when I win random stuff, cos really, who doesn’t like to win? Gimme, gimme more. I was bored and needed a reason to use my sculpted tongue from last week, so I am licking (or whatever vampires do before biting their victims) Pink Fuel’s Angel Panda.